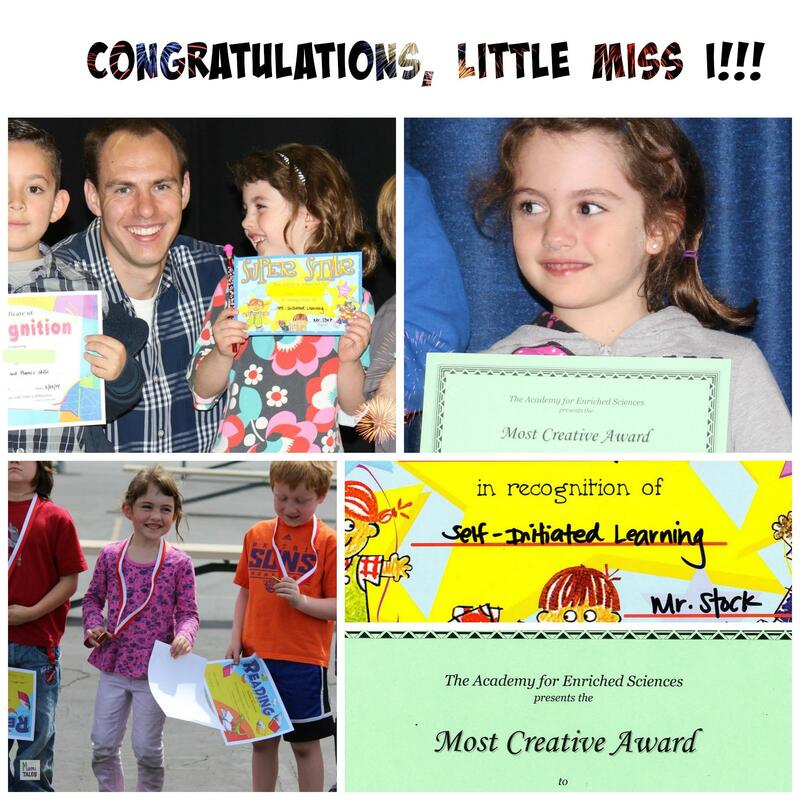 Last Friday, Little Miss I received an award at her new school, for their first reporting period. She has always been a wonderful student, but the area that she always stands out in is in creative endeavors. Last year, her first award was given by her Kindergarten teacher for having had the initiative to write a story of her own and share it with her class. He called that self-initiated learning, as Little Miss I would not only attempt to write her own books, but because she started reading chapter books on her own during down-times at school. That same month she also got a golden medal at school’s read-a-thon for raising money by reading books on her own for a month. This year, for first grade in a new school, she got the Most Creative award for her storytelling and her sharing of her violin practice with her classmates. As a tale-tailor myself, I’m immensely proud of my little one. And I’m very happy that she’s being recognized and supported in her creative endeavors by her teachers. I’d also like to take a little credit for having contributed to her imagination world, and for making her feel that she can pursue whatever it is that she loves, and she’ll be rewarded for her passion and hard work. I guess that having a passion for stories and reading can be passed on to the newest generation! And also kudos to her Dad for expanding her world of arts into music, for her violin practice which she now loves very much. Little Miss I has been invited to play a violin solo at her school’s holiday show next month, so I guess there’s a lot of practicing to do! So, there it is — my very proud mama moment. I just had to boast a bit about my wonderful little girl! Congrats to her! Celebrating successes is important! I definitely believe so! Thanks for the congrats and I’ll let her know! Congrats Little Miss! That is so awesome and good on you as parents to prioritize reading as well as music – two areas that should definitely be nurtured in children. Yay!!! Thanks for sharing your post in the Kid Lit Blog Hop! Thanks, Renee! She has both parents to tend to that for sure! I cover the bases with reading and stories, and her dad has been nurturing her music.